﻿﻿﻿﻿Red and gray foxes are common cousins with varied histories. ﻿﻿﻿﻿﻿﻿﻿Mistaken identity, different pasts, English heritage — no, this isn’t a Charles Dickens novel but rather a closer look at two foxes. While many of us have seen a fox darting through the shadows at one time or another, did you know that we actually have two main species of fox here in Texas? They are often confused with and mistaken for each other, but despite some similarities in appearance, they have very different histories. 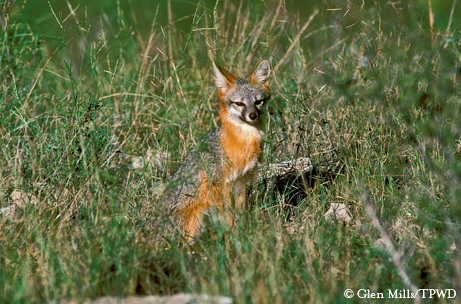 The common gray fox (Urocyon cinereoargenteus) is native to Texas and is our most common resident. The red fox (Vulpes vulpes) is found throughout the southeastern United States; however, it is originally from England. It was brought over for sport hunting purposes sometime between 1650 and 1750. It was introduced to Texas around 1895. Red foxes actually occur on many continents and were even native to North America, but they were historically confined to our northern boreal forests. The gray fox is named for its gray, salt-and-pepper coat. It has a white throat, cheeks and underbelly, reddish brown legs and a distinctive black-tipped tail. The red fox is primarily rusty red with a white underbelly, black ear tips and legs, and has a bushy tail with an unmistakable white tip. Both foxes weigh 7 to 11 pounds as adults. Both fox species are primarily nocturnal or at least crepuscular (most active in evening and early morning). Gray foxes prefer drier, brushy, rocky habitat. Red foxes prefer more heavily wooded habitats, as well as riparian zones and even urban areas. It’s not uncommon to find them right downtown, although they’re seldom seen because of their secretive, late-night habits. Both foxes are opportunistic feeders but are primarily carnivorous and prefer small mammals as well as birds, eggs, insects, some berries and fruit.